In the 1960s, as DC Comics developed their revamped Silver Age world of superheroes, they found themselves in a quandary–how could they explain all those earlier adventures of Batman, Superman and other heroes while maintaining the integrity of the new Silver Age stories? Thus was born the DC Multiverse, in which the Golden Age adventures now took place on “Earth-2” while the Silver Age took place in the contemporary “Earth-1.” Once this concept had been introduced, writers immediately began to play with it, introducing other Earths such as Earth-3, a world where Superman is evil and Lex Luthor is good. Alexander Luthor was an acclaimed scientist on his homeworld of Earth-3, one of many “alternate universes,” where history often played out in opposite versions of the Earth we know. When two of his counterparts from Earth-1 & Earth-2 set their sights on conquering his Earth, Alexander enlisted the aid of the evil Luthors’ respective archenemies, the Supermen of their world, to come to [sic] and help fend off the attack. In response, the evil Luthors partnered with Earth-3’s twisted version of Superman, the evil Ultraman, to back their cause. Born on the planet Krypton of an alternate universe where good and evil are reversed, Ultraman quickly became the most powerful super-criminal of that planet. A mirror-image of Superman, Ultraman had all the powers and abilities of Kal-El, only with the desire to use them for evil. He joined with other super-criminals to form the Crime Syndicate of America, the evil opposite force of the Justice League. 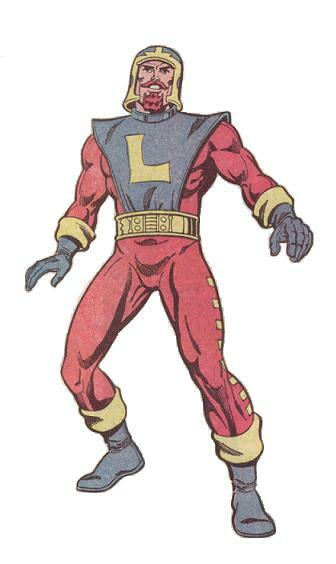 Ultraman’s primary opposition came from Alexander Luthor, Sr., a genius scientist devoted to bettering humanity through his inventions. Packaging: Mattel continues to try to appeal to MOC collectors by placing the figures in dynamic positions in the package. Visually, it looks great, but due to the rubbery plastic used to make these figures, it’s still causing problems. When I removed the figures from the package, Ultraman’s leg was twisted outward, as if someone had broken his leg at the knee (ouch). Fortunately, a quick dip in boiling water followed by a dip in freezing water fixed the leg so he can stand, but it still looks a little off. Design & Sculpt: Many collectors have expressed their wish that Mattel and the Horsemen create modern versions of these characters–or at least Ultraman, who would have been an even easier retool than the Silver Age version seen here. As you can see in the image above, the v-shaped mantle at the top of Ultraman’s chest and the “U” symbol are supposed to look like they’re an embedded part of the suit, as was done on the DC Direct figure. I think that looks terrible–like he stuffed a clothes hanger upside-down in his shirt–but if we want to discuss whether or not it’s accurate to the original design, it’s an important point. Since the Horsemen didn’t have the luxury of sculpting a brand-new chest section and had to retool an existing one, both the “v” and the “u” are and extra piece glued onto the chest. I actually think the “v” looks better here than on the comic design, so I don’t mind that. But the “u” looks like one of those children’s letter-magnets you put on a refrigerator–it’s too big and cumbersome, and makes the size and obtrusiveness of the chest addition that much more noticeable. The body is simply a re-use of the same heavily-muscled body we’ve seen before, but there’s another odd exception–the hands. Rather than using the bare hands found on, say, Captain Marvel (which are clearly bare, as evinced by the veins on them), Ultraman has what are clearly gloved hands painted flesh color, making them look swollen and wrinkly (apparently Ultraman was recently given the Melvaran mud flea vaccine). Some (but not all) of these issues are made up for by the awesome head sculpt. With his red eyes, widow’s peak, clenched teeth and vicious sneer, Ultraman looks like a vampiric Superman. I should add that the cape appears to be a new sculpt, too–a narrower version of the long cape seen on characters like Superman. I’d love to see this cape used on future Superman figures. Overall, Alexander Luthor, Sr. fares a bit better. He has more new tooling–specifically his head, tunic, belt, and forearms. The stitching on the edges of the tunic, the “L” symbol, and the forearm cuffs is a great reminder of just how good the Four Horsemen can be when they have a little more room to work. In order to preserve the ab crunch, the tunic isn’t connected to the belt on either the front or back. It looks a little weird, but this was probably the only reasonable solution to this problem. One thing to note: the cuffs on Luthor’s bucanneer boots appear to be upside-down. I’m not sure how noticeable or bothersome collectors will find this, but it’s another example of a QC issue that could have been easily avoided. As far as I can tell this issue seems to be found on ever Alex Luthor. Plastic & Paint: Ultraman is molded primarily in blue. His chest attachment is molded in the red of the “u” symbol while the “v” is painted blue, and that’s evident around the edges of the “u.” But the paint work on the head is pretty good, with a good blue drybrush on the black hair. The face itself is a little shiny, but the details are executed fairly well. Alex Luthor has a lot more paint work, and for the most part it’s pretty sharp. I like the choice of golden yellow for the highlights, and unlike previous figures (such as Captain Marvel or Big Barda), it’s used consistently. There’s a little slop around the forearm cuffs, but nothing glaringly ugly. 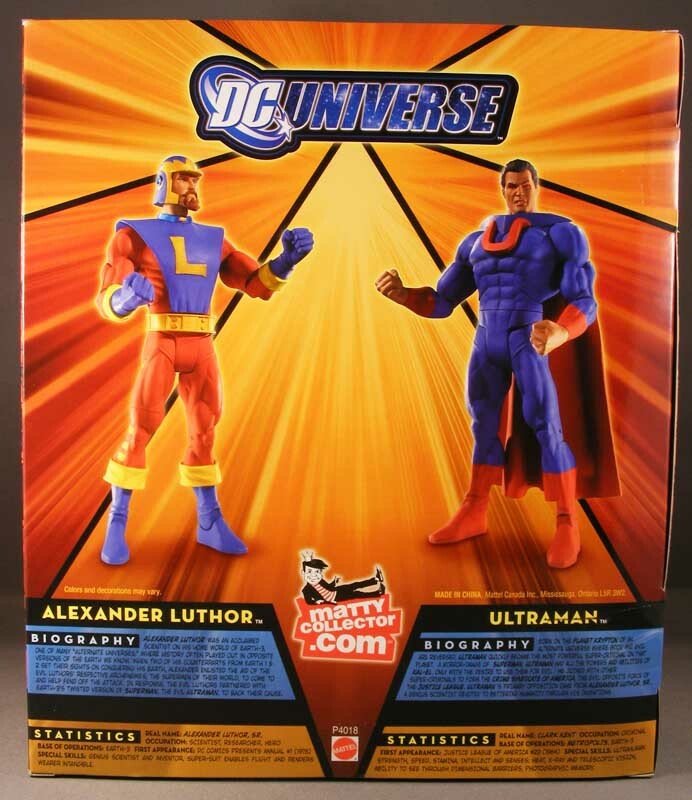 It’s also worth noting the small rectangular highlights along Luthor’s legs. 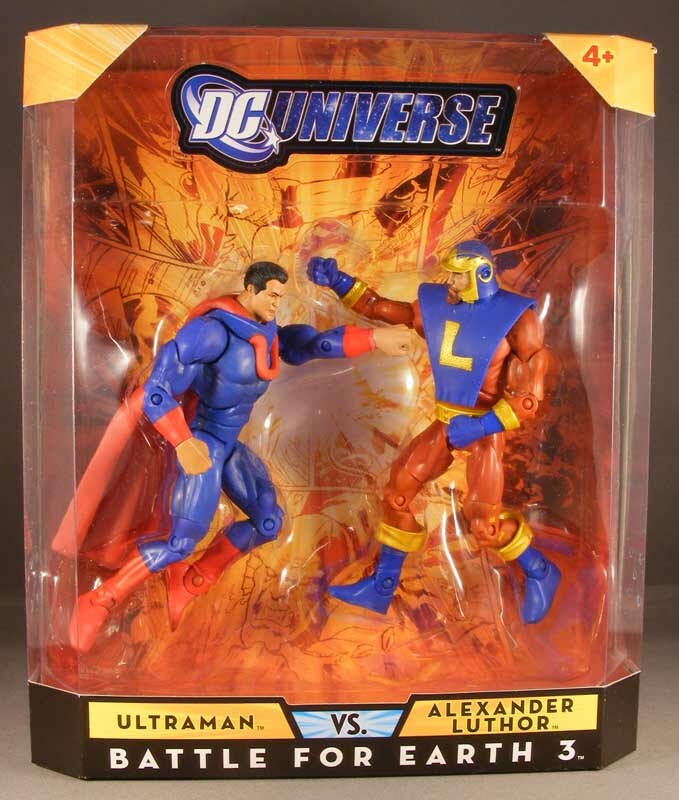 Articulation: Both Ultraman and Alex Luthor have the standard DCUC articulation: a ball jointed head, ball jointed shoulders, hinges at the elbows, knees, ankles and abdomen, swivels at the biceps, wrists, lower thighs and waist, and H-hinges at the hips for ball joint-like movement. Accessories: None–which is unfortunate. It makes sense for Ultraman, but since Alex Luthor appears to be a scientist-type, some sort of weird gadget would have been a nice inclusion, particularly for the $25 price tag on these sets. Quality Control: There’s the aforementioned Ultraman gloved fists and upside-down boot cuffs on Luthor. Furthermore, Mattel’s factories continue to use weak, probably reground plastic (plastic that’s recycled from leftovers and melted down) on certain parts, particularly the joints, making the figure feel rubbery and flexible–and making problems like the aforementioned twisted Ultraman leg much more common. The figures just feel cheap, and with the upcoming $3 price hike, that’s going to be even harder for collectors to swallow. I wasn’t thrilled with this set when it was announced, and now that I have the figures I’m still a bit underwhelmed. The QC issues, such as Ultraman’s fists, hurt a lot more when you’re already relatively unexcited by the characters. There’s a certain carelessness evident in the production of this set, and it’s at odds with the effort the Horsemen put into sculpting it. If these two-packs are going to start costing $30 (or $35!) on Mattycollector, problems like the fists and boot cuffs must stop or the oft-predicted end of DCUC may become a real possibility. Ultraman look like a decent/mediocre custom of classic costume Superman from wave 6, who had the same issue with his hands if you look. The head sculpt is good but they really should have just painted the U, or tampoed it or whatever. It would have been more accurate and looked better. It still would have looked like a custom maybe, but not as much. Alex Luthor actually looks really good, and I like the idea behind the characters. But pass. i think carelessness is the word of the day. like the starfire/adam strange two pack, this pack looks like average custom work with some nice head sculpts. in short, definitely not worth the price of admission. Excellent review Poe, it's convinced me to avoid this set. Like you, I wasn't too jazzed when it was announced and looking at the figures, they seem very lackluster. Thanks for saving me some dough on this one. It's stuff like this that killed my interest in being a completist for this line. Or any toyline anymore, really. Balls. Wow, I had no interest in these guys from the getgo, but I thought Ultraman might be nice. What a terrible looking figure. Looks like he's wearing Billybob teeth. That closeup of Luthor's face makes him look a little like the Burger King. I don't like these character s and i hate these qc issues. i thought they were done with qc issues!!!! I'll definetly pass on this one. Thanks Poe. You helped me make a decision…. TOTALLY appreciate all the pics! The play-doh 'u' on Ultraman's chest is the biggest reason I did not want this set. Thanks for taking the bullet for guys like me, Poe, by going ahead and buying the set so you can let us know what you think. Regardless of what I think about the characters/figures I always appreciate the review and pictures. Yes, thanks for the review, Poe. I really want these two-packs to sell well, but Mattel can't think some of these selections and poor quality figures won't affect our decisions to buy the figures. If they would ONLY give us reasonably good selections of characters …with the QC problems fixed… I would be buying the figures…to support this two-pack, Matty Collector approach. I think a lot of us would because so many of us want the 4-Horsemen, DC/Mattel line to succeed. Well, to be totally honest I don't think I'd ever have noticed Ultraman's hands had they not been pointed out to me. And I actually like the additional sculpting. Having no real connection to that costume I appreciated the extra tooling. Luthor, while I think the figure is very well done, admittedly has a pretty silly looking costume (I also never would have noticed that his boot cuffs are flipped…and am not totally sure they really are). Ultraman needs to see a new dentist. I'm used to the gloves at this point. It just makes him consistent with all the Supermen so far. This pack will really be a footnote in the future if more Crime Syndicate characters aren't coming soon. These characters don't generate much interest without them. Matty may need to rethink the obscurity level here and its feasibilty. Hopefully they're just testing the waters and the next 2 two-packs for the year will be a little more interesting. Cheetah and Toyman seem like prime candidates. Ultraman I could care less about, regardless of what they accessorized him with. Btw, wasn't he astronaut Clark Kent given abilities by aliens? or was that just his modern, Morrison/Quitely Earth2, origins? yet another NO SALE for MC from me. I just didn't care enough about the characters anyway but your review has pretty much confirmed what I thought about these two….easy pass. @Emerald: Except that there's no reason for those to be exclusive. They're prominent ebough in Superman's and Wonder Woman's worlds to be made available at retail. It seems likely to me that the male/female villain two-pack they've been touting is probably the Crime Syndicate Batman & Wonder Woman. I don't collect this line, but would buy a decent Batman and Superman. I wonder if the line will last long enough. . . I liked both these figures. They aren't fantastic and have issues Poe pointed out (though I like the big "U"), but I'm a big fan of the characters and appreciate that they got to them.